We spent quite a bit of money to come to Photoshop World Las Vegas, especially dinning for the past few days. 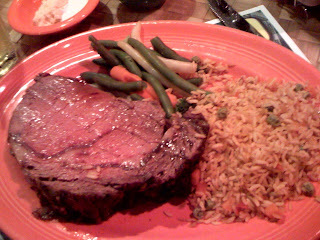 We decided to hunt for a good bargain and we went to Terribles Hotel and Casino just off of Paradise Road and Flamingo. Prime Rib dinner for $9.95 Friday special. It's not Ruth Chris, Mortons, or Arroyo Chop House. It was nonetheless dinner. I would rate this 4 out of 5 stars for bargain value.